Nationwide Louvre Company offers one of the most comprehensive services for high quality louvre systems in the UK. Our louvre systems are manufactured to the highest specifications from high quality materials such as HETF aluminium, steel, galvanized mild steel and plastisol so you can rest assured whether your application involves solar shading, sound proofing, architectural or special access requirements, at Nationwide Louvre Company we can design and build for purpose. 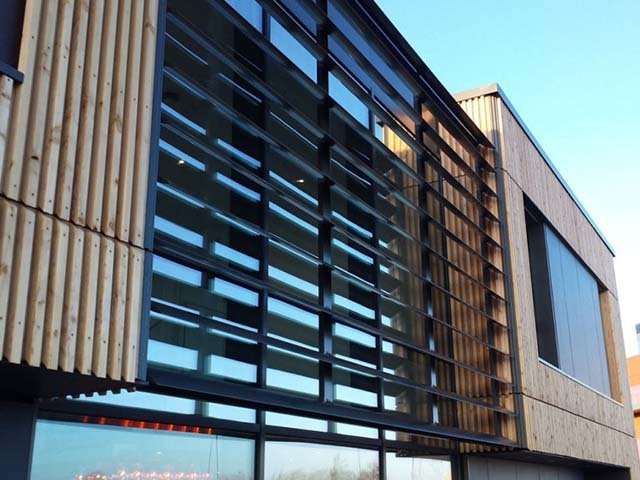 Nationwide Louvre Company are specialists in the design and manufacture of solar shading which not only reduces the problem of solar glare and heat gain but can also enhance the appearance of a building by making an architectural feature of the panels and the way they are supported. We are able to supply and install solar shading in a range of styles including blade profiles and finishes. Our specialist louvres are not manufactured to a specific size because every panel can be designed by joining individual modules and finished in a wide range of colours to suit the external mounting. These include circular louvres, triangular louvers, rectangular louvres, louvred screens, louvred doors and penthouse enclosures so to find out more please visit our website or get in touch. The acoustic panels installed by Nationwide Louvre Company are manufacture with two sheets of steel glued together onto a mineral high density wool of which can be galvanised or painted to suit its environment. Tailor made deliveries complete with necessary assembly profiles, flashings and jointing sections. As specialists in our field we manufacture one of the widest ranges of architectural louvre products with complex cladding components, architectural steelwork and aluminium bespoke fabrications so if you have any requirements in this area please do not hesitate to contact us. As experts in the construction of special access platforms we are able to provide a full computer aided design service to enable platform and mezzanine floor construction even around the most awkward places. This is only a small sample of the wide range of high quality louvre products and access installations National Louvre Company is able to provide so to find out more please contact us or alternatively visit our website.